Use this ritual to welcome the winds of positive change. You can perform it on any of the three days of the rising equinox energies that precede the equinox. Alternatively, it can be adapted for cleansing away negativity and sorrows at any time. I give an alternative version in my book Psychic Protection Lifts the Spirit. You can join with family or friends in a communal spring cleaning of a collective living area or workspace. Alternatively, you can use it alone to help you to clear out not only physical clutter but also emotional and spiritual stagnation in those areas of your life and relationships that would benefit from the winds of change. This spell is another that I performed on TV and though it involved a lot of laughter and dancing - as all good rituals should - many deep sorrows and anxieties were anonymously placed in the cauldron. Our ancestors probably took such folk magick a lot less seriously and so were able to tune into the natural joyous energies of the season. Begin your ritual in the morning. Open the windows and doors of the place in which you are carrying out the ritual. Alternatively, work in a yard or on a patio. 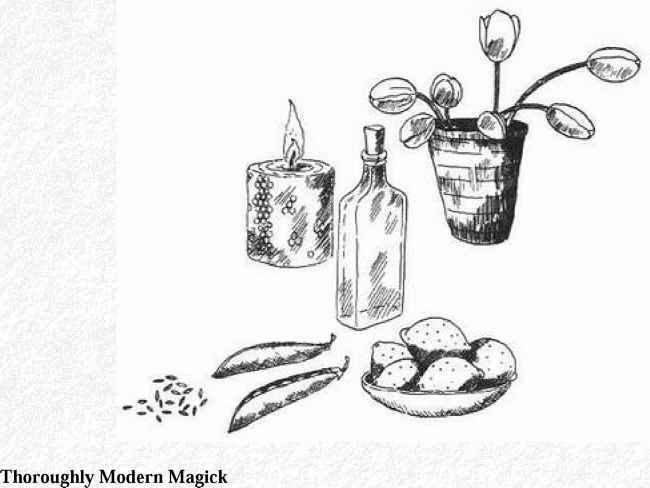 * Place your cauldron - a large pot, wide-necked vase or jug will do - on the floor. * Each of those taking part in the ritual should now write or draw on a piece of paper a representation of every redundant issue or bar to happiness and fulfilment that they wish to blow away on the winds of change. It is done, it is gone, no more to trouble me. Banished be. Out with sorrow, out with pain, joyous things alone remain. * Then take your broom, a traditional besom if possible, and hold it horizontally. If you are working with others, everyone should take the brush-head of the person to their right and the broom-handle of the person to the left, holding them horizontally at a comfortable height for all of you. Three times three, the power I/ we raise, Bringing with it happier days. Dust to dust, away you must. New life bring, welcome spring. * After the ritual is over, try to leave enough time in the remainder of your day to go to the top of a hill. Take a kite (made from a biodegradable fabric if possible) and in your mind, tie any lingering doubts, fears and concerns to the kite's tail and let it fly away. If you don't have a kite, use a feather for each of your worries and throw them into the air. Hopefully, a child will find the kite, cleansed by the winds, and it will bring joy. I know of a group of women who carried out a similar sweeping spell in the warehouse where they worked, using wood shavings for the negativity, and then swept out right through the yard into the packing bins which were later taken away by lorry. They commented that afterwards everyone was much more energetic and positive and the internal fighting and backbiting, which had been quite serious, melted away.